I produce more than 150 different unique products from fired clay in my studio. They are the result of our own development, creativity and imagination. In addition to my distinctive style combining Slovenian bobbin lace and clay, for an additional challenge and pleasure, I like to consider my customers’ individual wishes. Products can also be glazed. The glazes I use are user-friendly and reviewed by the Kranj Public Health Institute. Each product is decorated with natural materials in unique packaging made from recycled cardboard with additional promotional text or pamphlet. Products can be viewed and purchased at my studio in Kranj, which has the largest selection. You can also obtain them from shopping arcades and gift shops around Slovenia, as well as in its neighbouring countries. 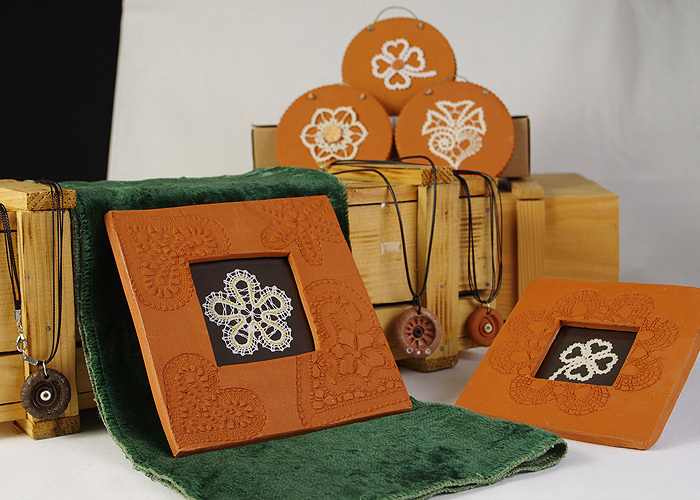 I combined bobbin lace made from flax, silk or metallized threads with clay tiles and terra-cotta frames of various sizes. 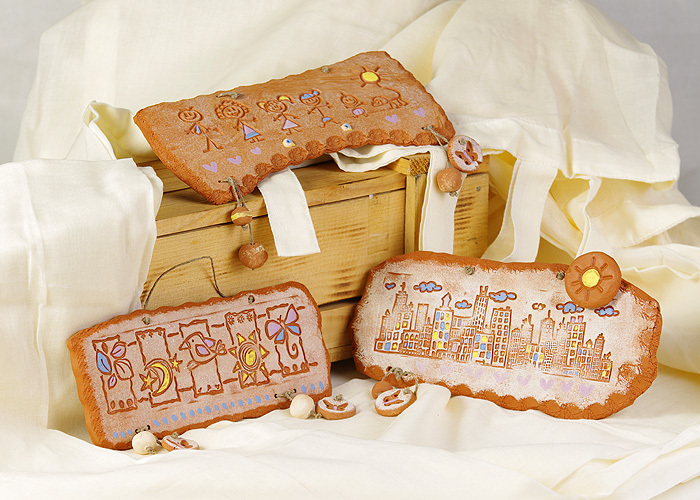 Different motifs have been used with traditional typology from Idrija and Ziri. I would be happy to frame your own lace as well. For wine to develop its own distinctive flavour with food, it must be properly chilled. For this purpose, I created a wine vessel that creates a proper wine temperature throughout, accompanied by instructions for use. Cheers! A rooster announces the sunrise with its singing and is a symbol of vigilance. According to folk tradition, a rooster protects the house and its residents from lightning and fire. 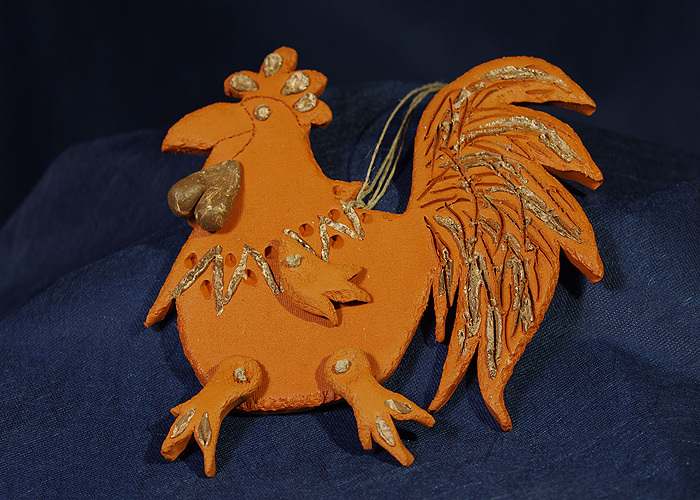 Let the rooster keep your fireplace safe, in a combination of light and dark clay. 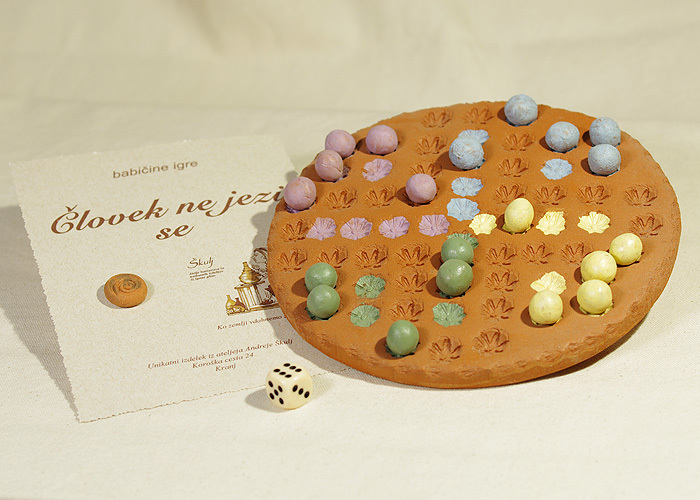 Ludo is one of the board games made of fired clay that I designed in a slightly different way. 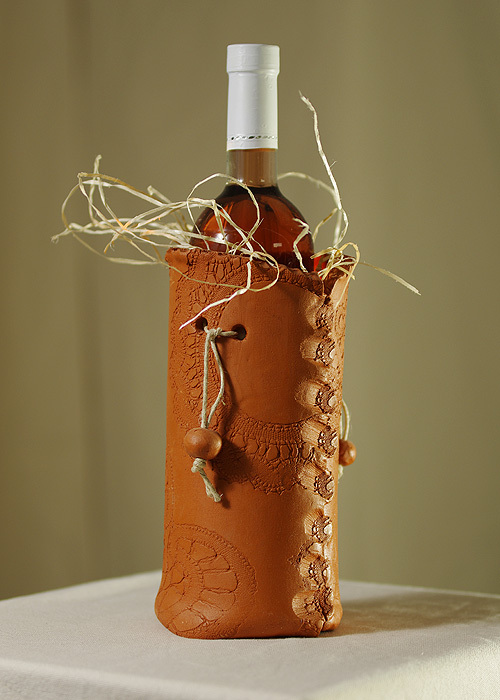 It can make an interesting personal or business gift for all ages and can bring different meanings to the recipient. 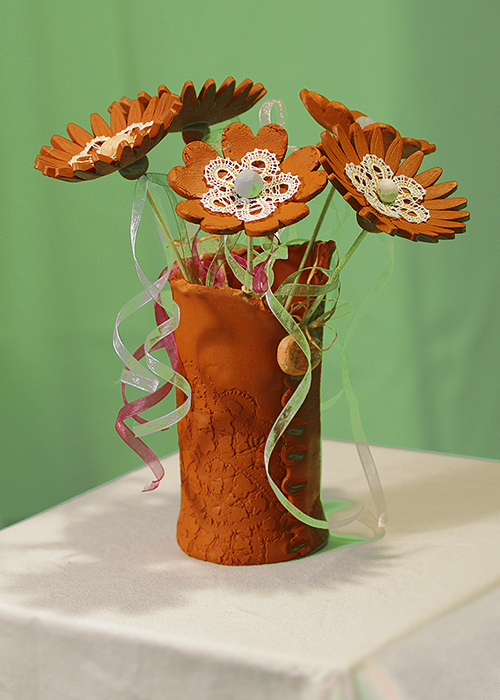 As a decoration, I added Slovenian bobbin lace petals to a flower made out of clay. It can be used independently as a single flower, added to your favourite potted plant or as a bouquet in combination with other flowers. I can guarantee it will not wither, even if you don’t water it. Colour reliefs serve as a nice wall decoration with mischievous, pastel-coloured designs, which will bring even more mischief and brightness to any room. 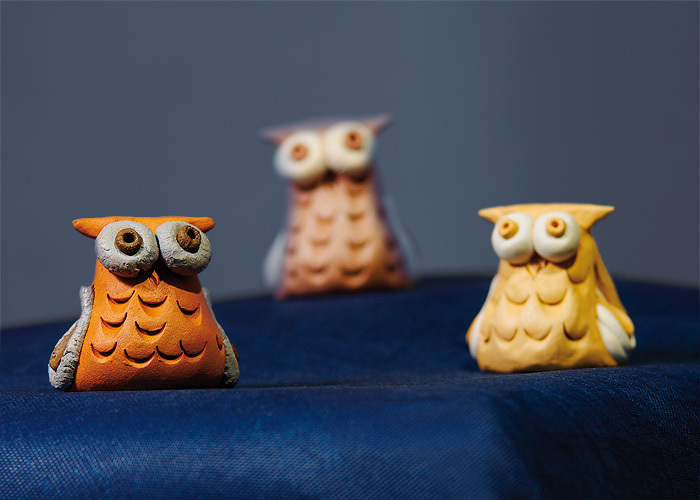 Owls come in different sizes and are made from different combinations of coloured clay. They can hang from the ceiling, peek out of windows, be attached as a magnet on a fridge or just stand on the shelf. Owls represent a well-known symbol of knowledge and wisdom.